This year, Antea has once again retained its ranking and achieved a good position in the 6th place, in terms of both, fee income and staff data. This association shows incomes of 138,5 million euros over the last 12 months. This includes having a significant growth rate of 2% in the number of the staff hired with almost 1.800 independent auditors, lawyers, accountants and tax experts. 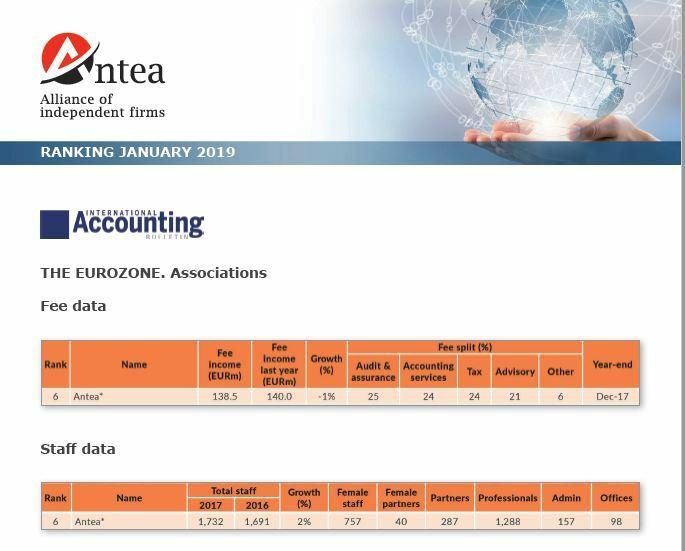 Antea continues to climb in the ranking, last year our association was the 9th in the list of the Eurozone publication achieving consistent growth thanks to record combined global revenues of its participant firms.